Heat the olive oil in a frying pan, over a medium heat. Meanwhile, mash up the banana in a bowl until no big lumps are visible. Then mix in the egg and an extra egg white. Add the oats and half the blueberries and mix well. Spoon the mixture into the pan to make 3 small pancakes. Cook for 1-2 minutes on each side, until golden and cooked through. 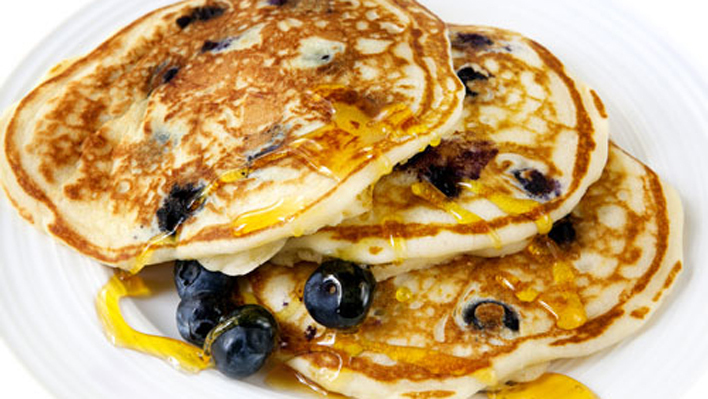 Serve with the rest of the blueberries and a drizzle of honey on top. Whisk the egg and add a splash of milk. Season and mix well. Pop the two halves of the thin into the toaster or under the grill. Microwave the egg for around 40 seconds and then give it another good mix. Put back in the microwave for a further 30 seconds and mix again. 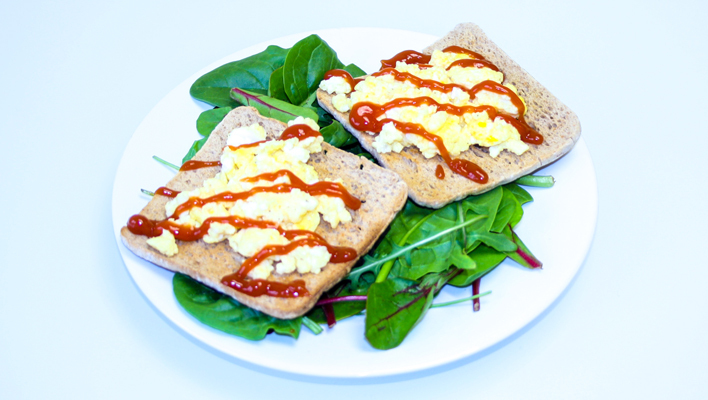 Lay a bed of watercress, spinach and rocket onto a plate and put the toasted thin on top. Add the egg and finish with a good squirt of ketchup (or another sauce of your choice). 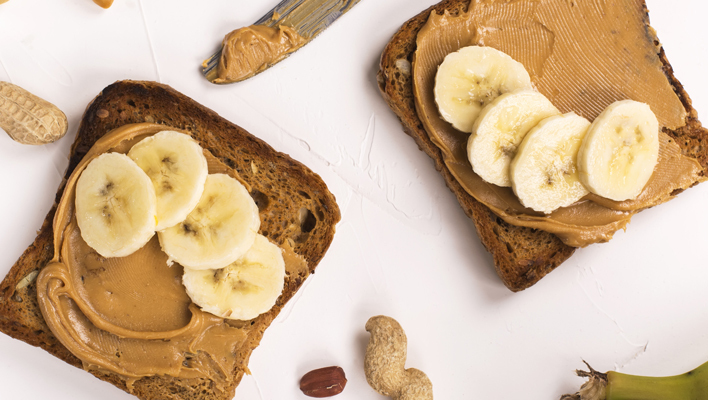 Evenly spread the peanut butter over each slice of toast. Slice the banana and top each piece of toast with half the banana slices. Add the porridge and milk to a saucepan or a microwavable bowl. Cook on the hob or in the microwave according to instructions. 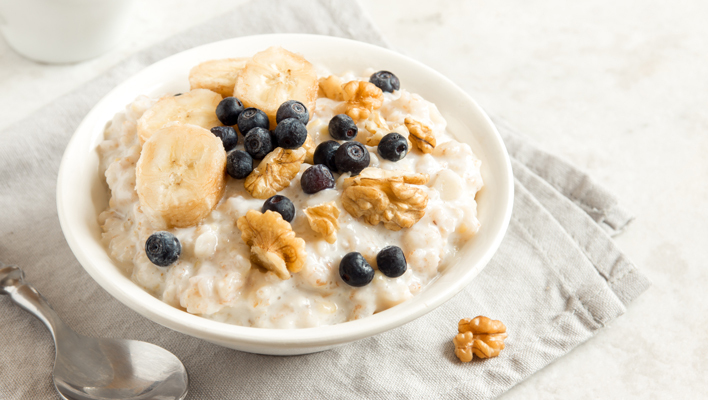 Mix in the honey and top with chopped banana, blueberries and the walnuts. Split the bagel in half and pop into the toaster or under the grill. Meanwhile break the eggs into a small bowl and whisk together. Season. Microwave the eggs for around 40 seconds and then give it another good mix. Put back in the microwave for a further 30 seconds and mix again. 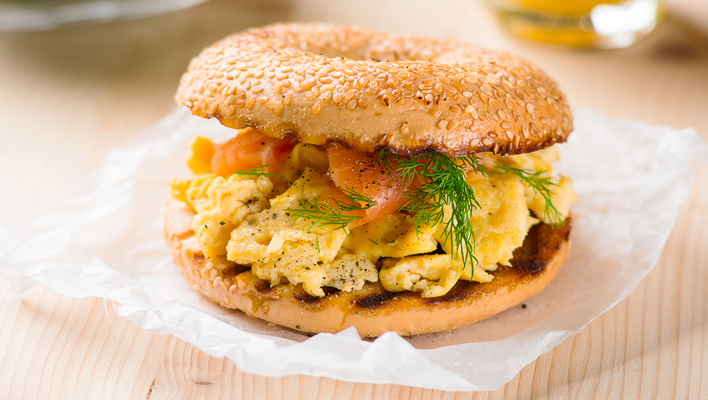 Spread the toasted bagel with low fat spread and top with the scrambled egg and smoked salmon. Garnish with fresh dill and serve.